Tramanco’s Kwik-Chek® dual or single axle group electronic on-board truck and trailer scale systems offer convenience, practicality, productivity and profitability, letting you focus on what’s important; total control of the job at hand. 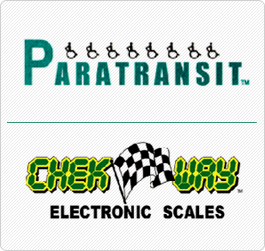 The Kwik-Chek cab mounted display is an affordable way to obtain the weights of single or dual axle groups. 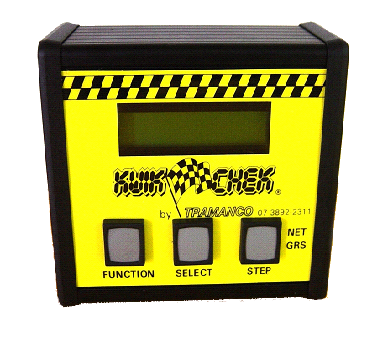 Kwik-Chek is an economical, high performance on board electronic scale for anyone concerned about, productivity and profitability. Kwik-Chek lets you focus on what’s important; total control of the job at hand. 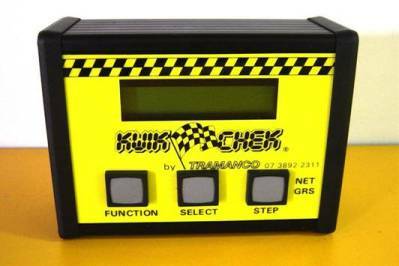 Kwik-Chek monitors air suspensions, steer axles, hydraulics and load cell systems. Weights appear in real time and can be displayed in Nett or Gross with the push of a button. Kwik-Chek is an investment in your business, providing convenience and affordability with a fast and easy way to position vehicle loads; reducing under loading and incorrect loadings. For more information or Product Manuals please contact Tramanco.